Experiencing and desire to experience, isn’t it the same form of hungriness? Seeking or being seeker, isn’t it the similar way of mind functioning? 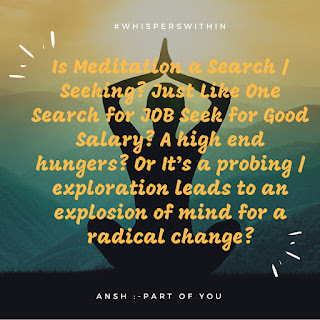 The way we search for Job, the way we search for wealth so on and on…. So far, the traditionalist explained the term meditation as an exercise of MIND rejecting one thought and desire to follow an object or thought to experience something different. When you do so, once again you fall in to the same phenomenon of job search or wealth search. Mind works in similar fashion. Some call it as emptying the mind, who is emptying? Once emptying is there someone to recognize the empty mind? Or it will remain unrecognized? Is it the training of mind on attentiveness? Which comprise of select and reject fundamentals? Or a comprehensive voiding of the mind function totally and leaving the function of body & organism alone without the referral identification of me & non-me, you & non-you? Look within ….. wish you will reach there…..